Demystifying the Mack: A Review of Kinohi Nishikawa’s "Street Players"
These lines from Ice Cube’s “Who’s the Mack?” are delivered at the end of his debut solo album—Amerikkka’s Most Wanted(1990), an album marked by his conspicuous turn from N.W.A.’s gangsta rap to a more Afrocentric nationalist rap identity. In “Who’s the Mack?” Cube turns his critical gaze toward some of his West Coast rap peers and the tradition from which they emerged—that of pimp culture. Cube, almost anticipating the resurgence of the pimp figure that began with Ice T in the late 1980’s and was about to explode with Snoop Dogg and Dr. Dre in 1993, questions the both the community productivity and authenticity of the pimp in the black community. He critiques the “game” of pimping in figures like legendary street fiction author Iceberg Slim, claiming that he replaces game and manipulation with just “kicking facts.” Ice Cube shifts this authenticity away from the pimp in popular lore by lyrically sampling “I’m just a straight up N-I-double G-A” from N.W.A.’s “I Ain’t tha 1,” a misogynistic track warning black men to be wary of exploitation by money-seeking black women. Layered atop 1970s mackadocious-era tracks like Fred and the New J.B.’s “I Wanna Get Down,” Lafayette Afro Rock Band’s “Hihache” and Marvin Gaye’s “T’ Stands for Trouble,” Ice Cube’s pimp critique attempts to relocate authenticity from pimp affect to blackness, suggesting that realness is located in the figure of the “N-I-double G-A” instead of the cool, smooth-talking figure of the pimp. The power of the critique of “Who’s the Mack?” is situated in an intersection among notions of authenticity, the market of rap, the history of the pimp figure in the black community, and the signifier blackness itself. 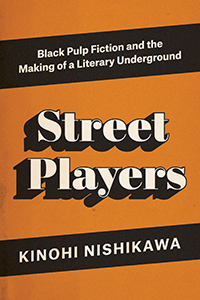 It is precisely in this intersection that Kinohi Nishikawa’s Street Players: Black Pulp Fiction and the Making of a Literary Underground intervenes. Nishikawa’s new study provides a material history of black cultural engagement with authenticity and pimp affect in the development of street fiction from black sleaze fiction to black pulp. Following the Holloway Publishing House, the L.A. publishing home of legendary street authors like Iceberg Slim and Donald Goines, Street Players traces the evolution of black sleaze literature to black pulp fiction to street literature. Importantly, Nishikawa defines his critical frame by focusing primarily on material history, which demystifies the massive cultural legends surrounding pimp figures like Slim and later Slim-inspired rappers like Ice T. Street Players is a poly-valent study that takes the history of street literature seriously without valorizing its figures, and it simultaneously critiques black authenticity as a market value that has been used to sell black images in the public sphere from sleaze literature to hip-hop. The first section of Nishikawa’s study traces the material history of black pulp through the early sleaze market in the 1950s. Black pulp emerged initially as a product for the white gaze, one that could be used to affirm white heterosexual masculinity that was experiencing a self-declared threat from 1950’s domesticity. For white male consumers, black sleaze represented a “rejection of the square, sissified world,” and their consumption of black bodies through this literary trend at the Holloway House constituted a reclamation of their manhood (41). Early production from the Holloway House and other sleaze publishers was designed to build masculinity through the negation of domesticity, a negation that many white readers imagined was blackness itself. It is in and through this white gaze that Robert Beck, more famously known as Iceberg Slim, enters into Street Players. Slim published the ur-text of street fiction Pimp: The Story of My Life (1967) as an authentic representation of pimp life in the 1940s and 1950s, and the Holloway House, Slim, and the media masqueraded the autobiography as an almost documentary-esque perspective of black masculinity. Nishikawa powerfully deconstructs Slim and Pimp’s mythos by focusing on the “conditions of production” that prohibited it from being understood “exclusively as a black man’s cry from the ghetto” (56). Instead of being a documentarian representation of black masculinity for a white readership, “Iceberg’s blackness serv[ed] as a mask through which white readers were allowed, or given license, to feel closer to their manhood” (57). Instead of being a “natural” interest for black readers, “racist distribution patterns ensured that Slim would become a best-selling author in black neighborhoods” (76). Ultimately, even with the origin story of his pimp name, Nishikawa demonstrates that Iceberg Slim’s account tells readers more about the conditions of production in the 1960s and the racist gaze of a white readership than “real” black male experiences. These conditions of production that Slim navigated within the white gaze, however, are also the same conditions that the second section of the study suggests moved black sleaze to black pulp with the formation of a black readership. At the center of this transition are writers like Donald Goines who Nishikawa describes as a “hack” writer, which he defines as a “specific stance or orientation towards authorship and the literary marketplace” that connotes writing for industry interest (137). Goines noted the growing black audience for narratives like Slim’s, but instead of presenting “race-exploitative tales” for a white audience, Goines’ fiction marked a transition toward “stories by black people, for black people, specifically about the black urban experience” (138). While Goines’ fiction is certainly industry-centered, Street Players suggests that his work in writing black stories for black people solidified the market that was opened by Iceberg Slim’s Pimp. In other words, Nishikawa suggests that market propensity—not any notion of neatly represented black authenticity—created the foundations for black pulp in the 1970s and 1980s. The last section of Nishikawa’s study suggests that two major developments moved from the new market for black readers. First, black women including the Holloway House’s first black woman editor Wanda Coleman, helped to adapt pulp for women readers. Even though it emerged from a dominant white male gaze, its market transition over time made it highly adaptable for black readers to shift this literary genre for different audiences. On a different trajectory, gangsta rappers like Ice T conspicuously picked up and adapted the Iceberg Slim pimp mythos in their work. In some ways, Street Players can be read as the material history not just of street literature but also of West Coast gangsta rap that emerged in the mid-to-late 1980s and flourished in the early 1990s. The hypercommodified affect of 1990s West Coast superstars like Snoop, Ice T, and even 2Pac (post-Suge Knight) can be directly connected to the formation of the literary marketplace that Street Players expertly maps. Nishikawa concludes his study by claiming that material environments like the street literature market and its claims to authenticity are marked by a “shifting signifier of blackness” (253). This shifting signifier plays with “both misrecognition and identification among different audiences and different consumers,” and Nishikawa’s materialist frame throughout his study allows this shifting signifier to be revealed in its material reality. Put simply, the street literature market demonstrates that authenticity is not so clear as something being real or fake, authentic or inauthentic; rather, Nishikawa masterfully demonstrates that black audiences shift can shift the signification of cultural objects and that authentic representation itself is a moving target in critical discourse. Nishikawa’s suggestion of the shifting signifier of authentic blackness is precisely why Ice Cube’s critique in “Who’s the Mack?” falls a bit short of deconstructing the pimp performance. Ice Cube appeals to the same type of affective authenticity as the pimp; however, he simply resituates that authenticity onto the “kicking facts” brand of authentic blackness rather than the pimp brand of authentic blackness. As Nishikawa tells us, commodified affective authenticity is not deconstructed through substitution of one affect for another, but rather it is deconstructed through recognizing the fugitive movement of blackness as a signifier itself. Gangsta and mack rap in the 80s and 90s—what Nishikawa calls “aural street lit”—plays on the same type of shifting signifier of blackness as Ice Cube, and both brands of authenticity are always moving and defined by the market, the white gaze, and black agency. Nishikawa’s intervention in authenticity and street literature studies helps us to understand the complexity of authenticity narratives without essentialism or reductive arguments. It paints a complex picture in the simplicity of its frame: to understand authenticity we must first turn to the structuralist components that allow it to flourish. Likewise, this study helps us understand cultural myths like Iceberg Slim’s without dismissing their potency in the marketplace and public sphere. Street Players rightfully places theoretical power in the material that allows readers to both examine authenticity and deconstruct cultural myths without disrespecting the cultural moments that create them. In other words, where Ice Cube falls short Nishikawa’s Street Players describes who, exactly, is the mack.